On the occasion of Hélène's 75th birthday, the older woman (played by Edith Scob) once again gathers her children at the family estate where she has ensconced--some would say entombed--herself since the death of her husband and, more importantly, the death of her uncle. The uncle was a world-famous painter, and Hélène, who may have had more than a familial relationship with the artist, has devoted her life to preserving his memory. The house is much like how he left it, but even though her offspring may call it a museum and/or a mausoleum, Hélène has not prevented it from being lived in. The broken Degas plaster is proof of that. It was shattered by her kids in their childhood, and one gets the sense that Hélène wouldn't mind if her grandkids were around enough to break a few more things. How one compartmentalizes the past and its art and makes use of it in the present is the major theme of Olivier Assayas's Summer Hours. The French film is the portrait of three generations of a family: one on the way out, one in charge of the right now, and the younger folk who will be in charge tomorrow. Given that this is Hélène's last birthday, her family will soon have pause to think about what this old place and the objects it houses means to them. In the process, Assayas will also explore how we communicate, how the different age groups communicate with each other, and how that affects what they care about. Hélène's children are threefold, as well, and they are as divided in the world as the generations are. Frédéric (Charles Berling) is an economics professor and author who lives with his wife and two teenaged children in France. Adrienne (Juliette Binoche) is a designer who lives in New York. She makes functional yet stylish home products, something that ties her to her mother's collection of goods more than she realizes. Finally, there is the youngest, Jérémie (Jérémie Rénier), who lives in China with his wife and three kids. There he works for Puma manufacturing cheaper tennis shoes. Hélène has no sentimental delusions about what will happen to her uncle's home in her absence. Though she has devoted herself to preserving his life's work and the things the late painter gathered around him, she knows that time passes and that yesterday's art is just the useless trinkets of today. She has explicit instructions for how the property should be divvied up, but when it comes down to it, Frédéric thinks the family should just carry on as they have, and that way their kids can all enjoy summers in the country the way he did growing up. Jérémie and Adrienne have different ideas, however; they are already disconnected and can better use the proceeds from the valuable collection of paintings, sculptures, and artisan furniture to continue to make life changes. Act I of Summer Hours is Hélène's final visit, Act II features her children settling her affairs, and Act III is the aftermath of the changes. Following the numbing task of putting everything their mother lived for into boxes, we see how the art and furniture is dispersed. For Frédéric there is some disappointment in seeing his mother's desk and a vase that her maid (Isabelle Sadoyan) used regularly for flowers put in the back corners of the Musée d'Orsay, where people walk by them without barely noticing. Oddly enough, Frédéric's frustration reminded me of Indiana Jones sending the Ark of the Covenant into the dusty warehouse, knowing its true majesty will never be seen again, its new context makes it one treasure amongst a legion. It's a little ironic that the man whose life is spent studying the distribution of wealth is the one who places some kind of emotional value on things, while his siblings who create things, both artistic and practical, are more concerned about getting more money. 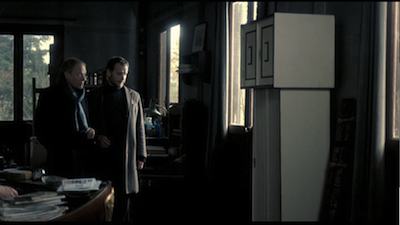 Assayas portrays Frédéric as not just more sympathetic, but also more empathetic. He lets that same maid take another vase for herself, a gaudy glass basket with green bubbles, even though the appraisers have said the unloved sculpture is worth a good deal of money. 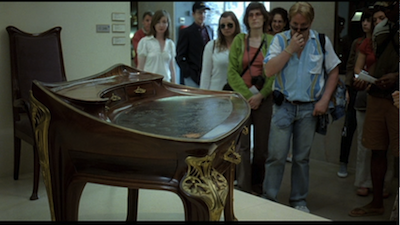 Frédéric doesn't even tell the maid that it's valuable, rightly guessing that she wouldn't take it if he did. Assayas can be a divisive filmmaker, and that is often because he seems to be divided himself. In one year, he can make a serious drama like Clean ; in another, the offensively smug thriller Boarding Gate [review]. The former's quiet examination of real-life drama is more indicative of the simple humanity of Summer Hours. The family dynamic that the writer/director creates lacks in the histrionics of more typical stories of this type. No one in this movie raises their voice when discussing what steps they will take. All of the children are practical and fair. Frédéric may feel railroaded, but that's just the luck of the draw. He was outvoted 2-1. Assayas and cinematographer Eric Gautier shoot Summer Hours with a naturalistic style, often using longer takes and maintaining an observant distance that allows the behavior onscreen to unfold outside of the point-counterpoint editing style of most talking-heads pictures. The aesthetic is somewhere between French New Wave and the Danish Dogme movement: slick and pretty to look at, but off the cuff. The scenery is shot in natural light, and it's full of the warm glow of life. The interiors are shot with the same appreciative eye, but the ravages of time show they lack the perfection of the real world. Much is actually made of how people arrange themselves and their furniture to try to fit in with the natural order. Feng shui, anyone? The acting in Summer Hours is quite good, and the performers fit right in with the realistic mis-en-scene. Renier regularly works with Jean-Pierre and Luc Dardenne, so he is no stranger to modern European Neorealism, and even comes off as more comfortable than his collaborators here. He often appears just a smidge more electrified than they do, which is also the prerogative of the baby of the family. Binoche is always good, and her best role might have been portraying the more active mourning of the heroine of Kieslowski's Blue . Here, her character has put a safe distance between herself and her grief, and Adrienne's sadness is covered up by activity. It's only when she sees the beloved tea set her mother promised her that the hardness breaks, and then she feels love and happiness rather than despair. The unknown quantity for me was Charles Berling. I wasn't aware of him before, but I'll definitely keep an eye out for his work now. Frédéric is more in tune with the heartache that comes with death, more aware of the changing of the times. Berling plays him as pensive, always a few seconds away from expressing his pain, just never quite able to figure out if he's missed his chance or if it's still coming. Issues with his own daughter, Sylvie (Alice de Lencquesaing), perhaps make him more acutely aware that he cares about things others do not, and the party that Sylvie and her brother throw at the old house after its sold would certainly seem to be proving that Hélène correctly predicted the changing of the tide. 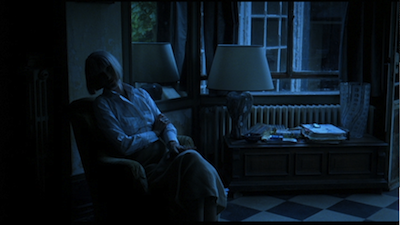 Yet, it's in those final scenes that Assayas let's us in on a little secret, that maybe the youngsters care after all. 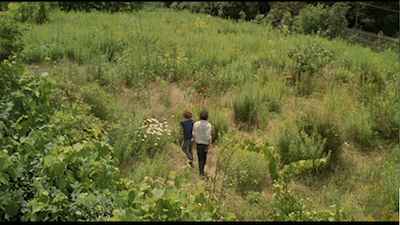 Summer Hours is a deceptively small film. It would be easy to miss all that it contains. Like the house that it depicts, it might seem to the untrained eye to be fussy and full of clutter, needing a good narrative scrubbing to get it in shape for the more conventional rules of dramaturgy. To viewers who know their stuff and who take the time to look, it's a different story altogether: that house is full of treasure just waiting to be examined, all it takes is a refined eye. Once you start looking around and giving it your time, Summer Hours proves itself to be rich, profound, and very worthwhile indeed. 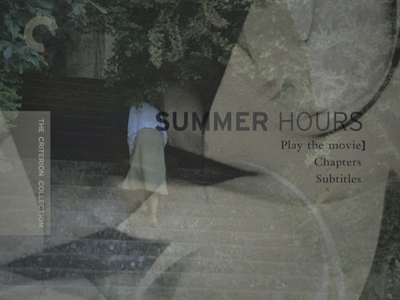 View the trailer for Summer Hours. It is my opinion that only the French can make a beautiful film about estate taxes. Every family of children that will ever have to clear out their deceased parents' house should see this film. It has it all.